Technology is playing an ever increasing role for the average horse racing fan. Punters can watch live racing videos, get betting advice, study the form and keep up-to-date via their phone or tablet. ​Bovada has long been a leader of mobile wagering innovation in the United States, and the company is staying true to that reputation with the release of its new mobile racebook. Available through the Bovada sportsbook, which is compatible with all types of iOS / Android smartphones and tablets, the racebook comes complete with a rich array of mobile betting options that will catch the eye of American horse racing fans. ​Ladbrokes and Coral has been ordered to halt its bet-to-watch online streaming service from all 22 race tracks covered by broadcaster At The Races (ATR). Tensions between the bookmakers and racecourses over media rights have escalated since the start of the year, when new betting shop channel The Racing Partnership (TRP) won control of broadcasting vision from six racetracks owned by Arena Racing Company (ARC), Britain’s largest racecourse ownership group and a major At The Races shareholder. The racetracks the company won rights to are Doncaster, Lingfield, Southwell, Windsor, Worcester and Wolverhampton. Leading horse racing channel At The Races has launched an enhanced mobile betting app that it hopes will expand its reach through a multi-device offering across Ireland and the UK. Developed in partnership with leading OTT Live and VOD streaming provider Simplestream, the upgraded app contains a tablet extension for iPad, a multiple betting system, live vision and replays, as well as offline viewing functionality. ​Leading Aussie bookmaker William Hill is catching the attention of live sports betting fans with the launch of its ground breaking in-play racing product Double Down. The exciting new feature, which is available exclusively to Australian iOS and Android punters, was launched in time for the start of the spring racing carnival in Melbourne, and provides bettors with the opportunity to double their racing wagers, at pre-race odds, after the jump. ​British broadcaster ITV will live stream horse racing to smartphones and tablets across Ireland and the United Kingdom through its ITV Hub iPhone and Android app, a move the industry is hoping will boost dwindling audience numbers. As part of a four-year deal to commence in 2017, ITV snared the broadcasting rights to UK horseracing from Channel 4, and has quickly turned its attention to delivering the sport maximum exposure through a multi-platform offering. William Hill Australia has struck a deal with Racing NSW and the Australian Turf Club to live stream New South Wales Thoroughbred Races. The landmark agreement will see William Hill become the only corporate bookmaker to live stream NSW races Down Under. The service will be available on William Hill’s website and mobile betting app, which is available to both iOS and Android users. The likes of Ladbrokes, SportsBet and CrownBet reportedly all submitted tenders to secure the highly desired streaming rights, which add to William Hill’s growing portfolio of streaming services and commercial partnerships. The company is the official wagering partner of the Australian Open and, as part of its agreement with Tennis Australia, has live streaming rights for the tennis season’s opening grand slam. Australian bettors are being offered larger racing odds through leading Aussie bookmaker Sportsbet’s new Power Play feature. Available exclusively through Sportsbet’s app on IOS and Android mobile devices, Power Play allows bettors to increase their odds on thoroughbred, greyhound and harness racing bets. Sportsbet Mobile, owned by Irish bookmaker Paddy Power, has made the feature easy to use, with bettors simply having to click on the ‘Power Play’ button that appears alongside selections on their betting slip. The size of the odds boost is determined by the original price, with shorter odds receiving a smaller percentage increase than larger odds. Channel 4 Racing have created the Pick 6 app - a horse racing fantasy game with a fantastic weekly prize pool of £10,000. The competition is completely free and players from the UK, Ireland, Channel Islands or the Isle of Man can participate. The Pick 6 is available on the web and there is also an iOS mobile app that can be downloaded from the Apple App Store. Just open an account and you can compete each week for free. There will be 6 horse races and you have to pick the winner of each of them to win the £10,000 grand prize. If no one manages to do so, the best player will still get a £1,000 as a consolation price. At The Races, the UK's satellite horse racing channel, have launched their ATR iOS and Android mobile app, providing you with a wealth of racing information straight to your smartphone or tablet. The app hosts all the daily news stories, which appear on the At The Races website, in addition to videos of recorded race day previews and recaps, interviews and features recorded. You can also view all the previous days racing, or subscribe to ATR and watch all the live coverage, streamed straight to your device. ​There are many useful tools here for racing bettors. Not only can you view all the day's race-cards and live prices, there is plenty of information on each horse. The ATR app not only shows the jockey and stall number (where appropriate), by tapping on each horse you can view its official rating, the trainer, weight carried and breeding. You can also find a brief summary of its form, or view the full form, which includes replays of previous runs. With one of the greatest sporting events on the planet just around the corner, we thought it best to bring you some of the best apps related to the Cheltenham festival in 2015. The apps are broken down into headings, as you will see below, and from there we will highlight the reasons as to why they have been picked in each category. 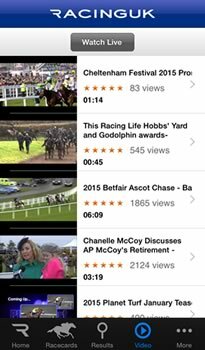 The best live streaming app that we have come across for the festival is the Racing UK app. Now, the app isn’t the cheapest at £15.99 but in terms of value for money it can’t be beaten. First off, you don’t need to subscribe for the full 12 months as this special rate of £15.99 will allow you a months access, but if you do decide you want it for 12 months then the price will drop to just £9.99 a month. Not only do you get live streaming of EVERY race from the festival, the only place in which you can see this may we add, but you also get a ton of additional features and race information right at your finger tips. In terms of depth for previews and analysis of each race and horse then you won’t be find a better package for the price. The app can be accessed on iPhone, iPad and Android devices and the stream actually takes up very little usage and can be easily viewed on a 3G connection.